The first meant that if there was blood in the story, it was front page news. That was mainly for the insiders, the people in the industry. The second one isn't just for insiders, but is something everyone in the perpetually offended crowd should understand. Publicity is powerful regardless of its intent. Publicity makes the public aware of something that until then few people noticed. I was working for a small family-owned chain of building-supply stores. The owner liked to be the "star" of any television commercial advertising the store. One Spring, he did a spot about all of our yard and garden tools, which we were putting out at special sale prices. In the background and slightly out of focus were many of our concrete statuary pieces. The day after the ad first aired, we sold out of our concrete statuary, which were never mentioned in the ad. A couple of years later, I was working for a local newspaper. One of my tasks was film review of the current video release, which back then, came out six months after box office release. There was a lot of noise about a film entitled "Show Girls." People were up in arms about the "filth" that was being brought into our community. Picket lines were formed in front of Hastings Books decrying the fact that they would dare to carry such trash. I could not get a copy of the film until three weeks after it had been out. Every time I would check, a clerk would tell me "All 33 copies are out." One of them even volunteered, "Why do you want to watch that? It is really bad." "What do you mean 'bad'?" I asked. Finally, one day, they were emptying the return bin when I arrived, and a copy was in the collection. I snagged it and took it to the checkout, and then home to watch one of the worst films ever produced. Direction, dialogue and display done by dilettenti. The girl at the checkout told me, "If people hadn't made such a fuss over this, it would have died the first week." So-called "negative" publicity gave life to the very thing the publicists were trying to kill. Therefore it would appear that Christians are caught between the proverbial rock and hard place. Many feel duty-bound to loudly proclaim to any who will listen the sinister aspects and agendas of those who do not know the Lord. Yet, when they do, they only help the cause of the one against whom they speak. I have just become aware of a controversy swirling yet again around Starbucks. Of course, by the time this article sees the light of day, many will wonder what in the world I'm talking about, because we will most certainly have moved on to a new offensive something-or-other. 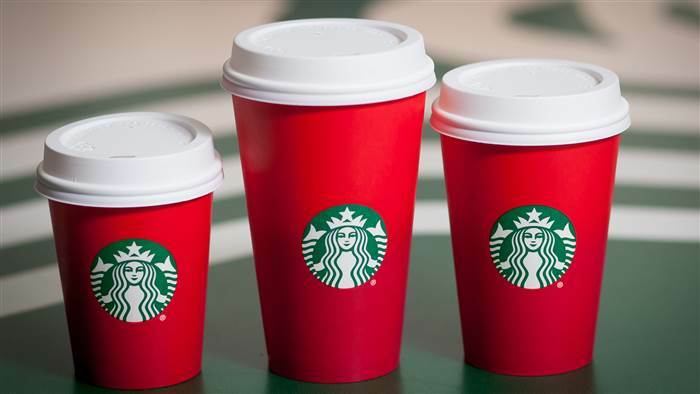 It seems that we should now be outraged that Starbucks has changed its holiday cups to just a simple red cup (with the green logo). Social media is alive with outrage as "Starbucks wages war on Christmas." Prior to this, the coffee cup only had symbols of the season—ornaments, bells, trees, etc.—none of which were religious in any way. No manger, wise men, nativity rendering. There were reindeer designs, but I don't recall them being listed as hovering around the manger when Jesus was born. If I were so easily outraged, I think I would be outraged at this outrage. I am ashamed to be associated with such infantile shenanigans. They are my brothers and sisters in the faith, though. I stopped in at a local Starbucks to get a cup of coffee they were giving to veterans. While waiting in line, the ridiculousness of this whole thing struck me, and I doubled over with laughter. The manager came around the counter to see if I were okay. I pointed to their dark roast selection for the day—"Christmas Blend."